On Wednesday we fast for Yom Kippur. On Thursday at our Annual Meeting, our Federation will celebrate accomplishments for the past year and look towards the challenges we hope to conquer in the coming year. And the only comparison I’ll draw between the two is that, in a sense, Yom Kippur is the Annual meeting of the Jewish people and of each Jewish person where we can look back and look forward. I hope each of you has a spiritual home where you can spend Yom Kippur. 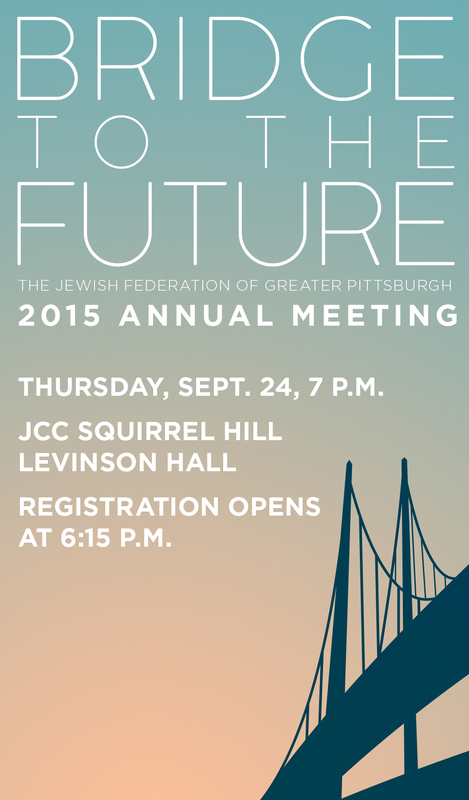 And I hope many of you will be able to join us on Thursday night at 7:00 pm at the JCC in Squirrel Hill for the Jewish Federation of Greater Pittsburgh’s Annual Meeting. There, we will celebrate the Volunteers of the Year from over 40 different Jewish organizations and congregations. We will announce impressive results for our Federation and community. We will discuss some of the issues we continue to address. We will install a new Board and thank our outgoing volunteer leadership for all they have done. One thing I can promise you about our Annual Meeting: unlike your Kol Nidre services on Tuesday night, we’ll have refreshments! Shabbat Shalom. Wishing you an easy but very meaningful and inspiring fast.